Supporters of SDSU West said Monday a new telephone poll they commissioned shows strong support for the ballot initiative among likely San Diego voters. 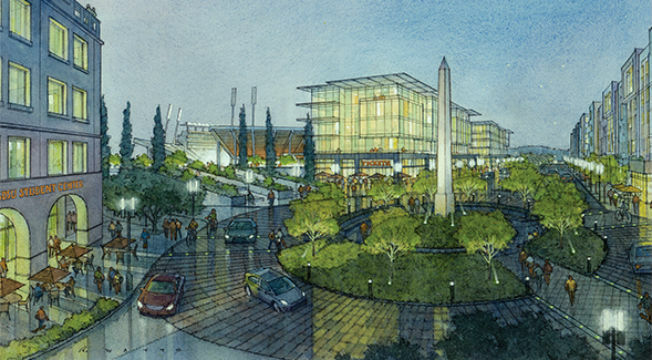 The poll found that 62 percent favored the SDSU West plan for the Mission Valley stadium site, versus 40 percent for the competing SoccerCity initiative. The SDSU West initiative calls for a new 35,000-seat Aztecs football stadium that could also be used for other sports. The measure includes hotels, retail space, a river park and an academic campus to be shared with commercial office tenants. The SoccerCity initiative proposes new housing, shopping areas, restaurants, offices and a river park, as well as a 23,500-seat professional soccer stadium that could also accommodate Aztecs football. Both initiatives were placed on the ballot by signature drives. The poll was commissioned by SDUS West and No on SoccerCity and conducted June 18-24 by EMC Research, a national polling and data firm. The results are based on live telephone surveys of 495 likely November 2018 voters in the city of San Diego. Interviews were conducted in English and Spanish, and both landlines and mobile phones were included.